Beneath the skin, your hands are an intricate architecture of tendons, joints, ligaments, nerves, and bones. Each of these structures is vulnerable to damage from illness or injury. If your hands hurt, even simple tasks can become a painful ordeal. 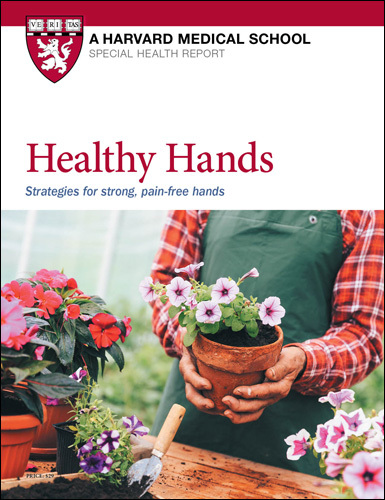 Healthy Hands: Strategies for strong, pain-free hands describes the causes and treatments for many conditions that can cause hand pain. It also features information on hand exercises, as well as handy tools and other gadgets that take strain off your hands. Is hand pain interfering with your ability to do all you want — and need — to do? Find out how you can ease the pain and limitations of arthritis, carpal tunnel syndrome, and other hand ailments. 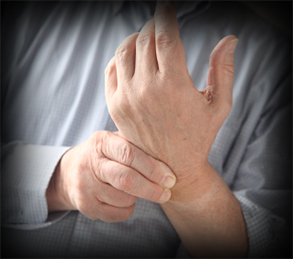 Hands are unavoidably vulnerable to ailments and injuries. When they happen, your daily routine can become an ordeal, ordinary tasks can become a struggle, and simple pleasures are put aside. Fortunately, almost every hand problem can be successfully treated. Pain can be significantly reduced. Mobility and dexterity can be regained. This Special Health Report will give you an empowering understanding of your hands’ mechanics, the diseases that compromise their function, and most important, what you can do to treat, lessen, and prevent the major threats to your hands’ health and strength. Do you suffer with arthritis? The report will brief you on advances in quelling the symptoms. You’ll find out about the growing choices in medications as well as promising complementary therapies and alternative remedies. The report will tell you about treatments that offer relief from carpal tunnel and other “pinched” nerve syndromes. You’ll learn what causes “trigger finger” and how “writer’s cramp” is cured. The report will give you the key questions to ask yourself — and your doctor — before considering joint replacement surgery, and much more. So, enjoy life hands on. Order your copy of this Special Health Report now. After I described my symptoms to my general practitioner, she referred me to a therapist. During the assessment, the therapist touched different parts of my hand and arm and asked about my symptoms, which included occasional numbness in my fingers. The pain in my hand had gotten worse—it was like a constant, low buzz I couldn’t ignore. I also noticed that my fine motor coordination had declined. I like to paint and draw, but holding the brushes and pencils wasn’t comfortable. I also had some difficulty writing with pens. The therapist recommended ice to ease the discomfort, as well as an ergonomic evaluation of my workspace. The computer workstations I was using at the time weren’t ideal. For instance, where I took classes, the monitors were mounted below a piece of glass on the desktop, so you had to look down into the desk to see them. Fortunately, I was able to get a free ergonomic evaluation of my workstation at the university where I worked. I learned how to correctly adjust the height of my chair, my monitor, and the angle of the monitor to put less stress on all my joints. They also set me up with an adjustable keyboard tray, which you slide out from under your desk and position in a way that allows you to keep your wrists and forearms straight. I experimented with different setups for my mouse as well, such as using the opposite hand, using a different style of mouse, and putting the mouse on a keyboard bridge. The bridge, which sits up over the number pad on the keyboard, allows you to keep your hand closer to the center of your body, which is less stressful for your lower arm and hand. After about two months, I noticed a big improvement. Now I’m careful not to overuse my hands and to always make sure I’m keeping my wrists and the rest of my body properly aligned to avoid a relapse.